When judging a company's prospects, how quickly it makes real cash money can be just as important as how much it's currently generating in the accounting fantasy world we call "earnings." It's one of the first metrics I check when I'm hunting for the market's best stocks. Today, we'll see how it applies to NVIDIA (Nasdaq: NVDA). In this series, we measure how swiftly a company turns cash into goods or services and back into cash. We'll use a quick, relatively foolproof metric known as the cash conversion cycle, or CCC for short. To calculate the cash conversion cycle, add days inventory outstanding to days sales outstanding, then subtract days payable outstanding. Like golf, the lower your score here, the better. Here's the CCC for NVIDIA, alongside the comparable figures from a few competitors and peers. Source: Capital IQ, a division of Standard & Poor's. Dollar amounts in millions. Data is current as of last fully reported fiscal quarter. TTM = trailing 12 months. While I find peer comparisons useful, I'm most interested in comparing a company's CCC to its prior performance. Here's where I believe all investors need to become trend-watchers. Sure, there may be legitimate reasons for an increase in the CCC, but all things being equal, I want to see this number stay steady or move downward over time. Because of the seasonality in some businesses, the CCC for the TTM period may not be strictly comparable to the fiscal-year periods shown in the chart. Even the steadiest-looking businesses on an annual basis will experience some quarterly fluctuations in the CCC. 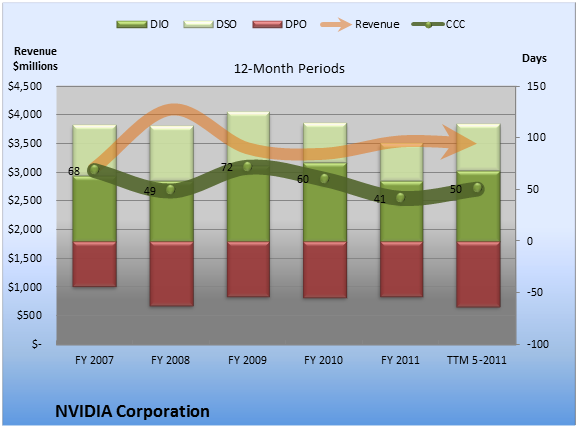 To get an understanding of the usual ebb and flow at NVIDIA, consult the quarterly period chart below. Source: Capital IQ, a division of Standard & Poor's. Dollar amounts in millions. FQ = fiscal quarter. On a 12-month basis, the trend at NVIDIA looks very good. At 50.4 days, it is 7.6 days better than the five-year average of 58 days. The biggest contributor to that improvement was DPO, which improved by 9.3 days compared to the five-year average. That was partially offset by a 2.4-day increase in DIO. Considering the numbers on a quarterly basis, the CCC trend at NVIDIA looks good. At 45.9 days, it is little changed from the average of the past eight quarters. 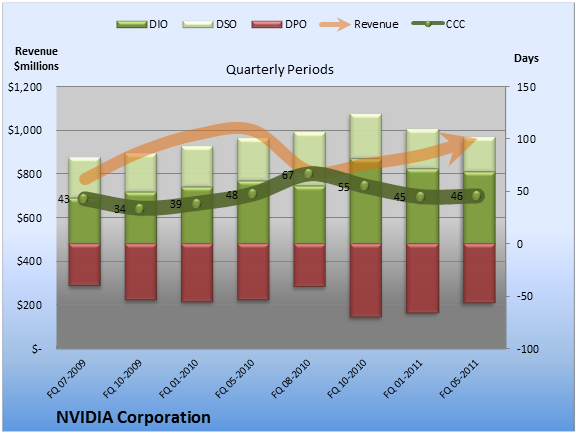 With both 12-month and quarterly CCC running better than average, NVIDIA gets high marks in this cash-conversion checkup. To stay on top of the CCC for your favorite companies, just use the handy links below to add companies to your free watchlist. Add NVIDIA to My Watchlist. Add ARM Holdings to My Watchlist. Add Marvell Technology Group to My Watchlist. Add Intel to My Watchlist.